Whether you are currently attending USC, the parent of a USC student, or alumni, we hope you consider Our Savior your second parish and home-away-from-home while at USC. 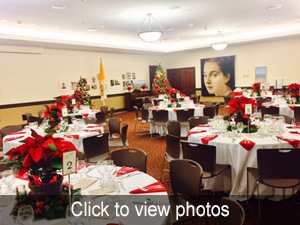 We would love to work with you on hosting your next event in either Our Savior Church or the USC Caruso Catholic Center. Please email us to determine availability and for more information. 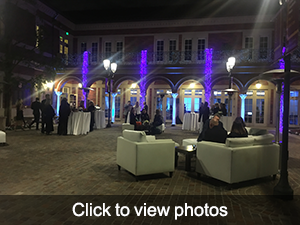 We opened the doors to the new Our Savior Church and USC Caruso Catholic Center in 2012 following completion of a 10-year building campaign. We invite you to visit our beautiful facility, situated one block north of campus off the pedestrian walkway, University Avenue. Though we do not currently offer regular tours of our facility, we are more than happy to schedule special tours for groups or individuals. If you are interested in learning more about our community and facility on a private tour, please email Rudy Lowe. To access on-site parking for Our Savior Parish and USC Caruso Catholic Center enter from S. Hoover Street, south of W. 32nd Street. Additional off-site parking is available across the street at the USC Village parking garage at 3131 S. Hoover Street, access to the garage is on the west side of the intersection of W. 32nd Street and S. Hoover Street. Visitors to Our Savoir Parish and USC Caruso Catholic Center can obtain a validation for three hours of free parking at the USC Village parking garage. Please check in at our reception office for a validation. Our Savior Church is a beautiful facility featuring stunning artwork from a number of talented artists and seating for approximately 350 worshippers in the pews. Due to the sacred nature of this space, we typically only allow rentals of the space for sacraments and religious purposes; however, we review all requests on a case-by-case basis. For information about getting married in Our Savior Church or completing any other sacrament, please email Deacon Paul. 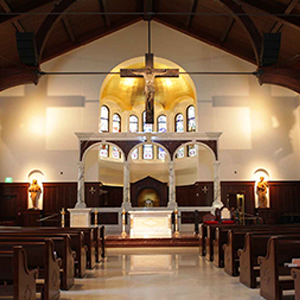 The USC Caruso Catholic Center is the home for our campus ministry and staff operations. In addition to office space, the Center also includes a café (housed in the Stevens Student Lounge), McCarthy Library, classroom, campus ministry lounge, large multipurpose space (Newman Hall), catering kitchen, and courtyard patio. We welcome venue rental requests for the library, classroom, Newman Hall, and courtyard. For additional information or to request to rent a venue, please contact Rudy. Staffing Fee: $20 per hour per event captain. We require a minimum of one student event worker present from setup until cleanup. We may increase the number of workers depending on the size and nature of the event.